Q: FIRST AND FOREMOST, IS THE 2018 KX450F BETTER THAN THE 2017 KX450F? A: No. There are a few things about the KX450F that could stand to be addressed; however, with four-year production cycles, only small changes are made over the 1460 days. The 2018 KX450F is the third model year of this generation. In 2016 it was totally new—and totally improved over the 2015 KX450F. It was lighter, thinner, lower, sleeker and better-handling than the stodgy, old-school version that came before. 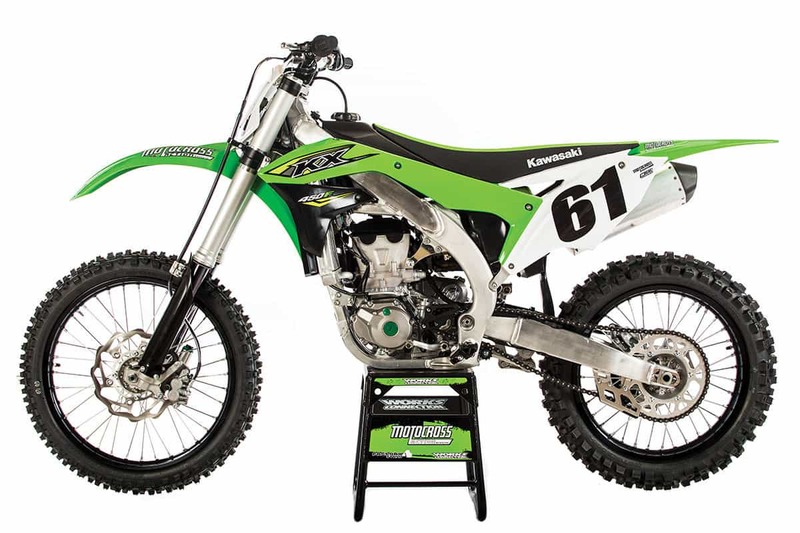 For 2017, Kawasaki engineers redesigned the rear shock linkage, beefed up the top triple clamp’s rigidity, added new mapping to lessen decel popping, lightened the shock spring (but not the spring rate), stiffened the seat base and went with in-mold graphics on the radiator shrouds. So, what did Kawasaki do for 2018? Nothing, save for MNG (Mildly New Graphics). Q: WHAT SHOULD KAWASAKI HAVE CHANGED ON THE 2018 KX450F? A: The mapping, forks, starting, clutch, airbox sealing, chain guide and horsepower. If the 2018 Kawasaki KX450F looks familiar, that’s because it is. For 2018 the Kawasaki engineers decided to stand pat with the 2017 model. Q: WHAT NEEDS TO BE DONE TO THE MAPPING? 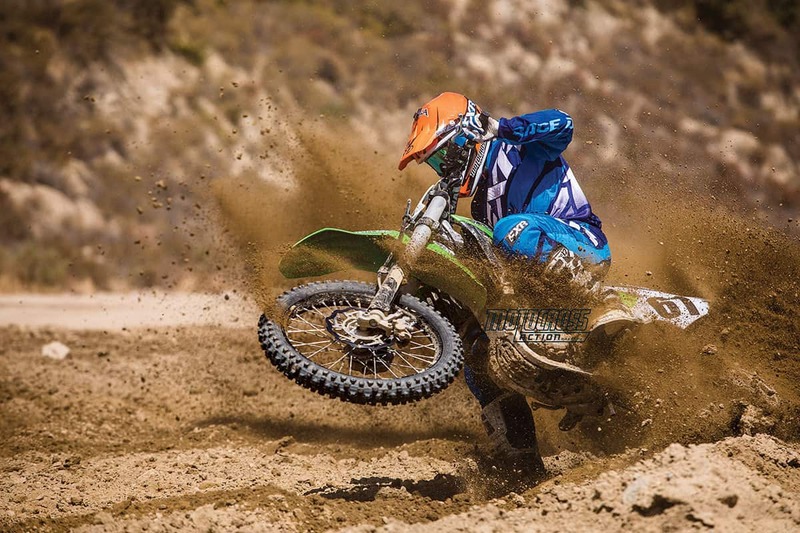 A: In 2016, the Kawasaki KX450F popped and banged like New Year’s Eve in Tijuana. It sounded like a shotgun going off every time the throttle was rolled off. For 2017 Kawasaki remapped it. It was much improved. Not only was the decel pop reduced, but the engine ran cleaner, felt crisper and had a better low-to-mid transition. So, what do we want changed on the mapping for 2018? There is still some decel pop, which indicates that it is still a little lean. Worst of all, the KX450F powerband is not impressive after 8800 rpm; it gives up too quickly on top. Linear powerbands need to pull as far as possible to work. 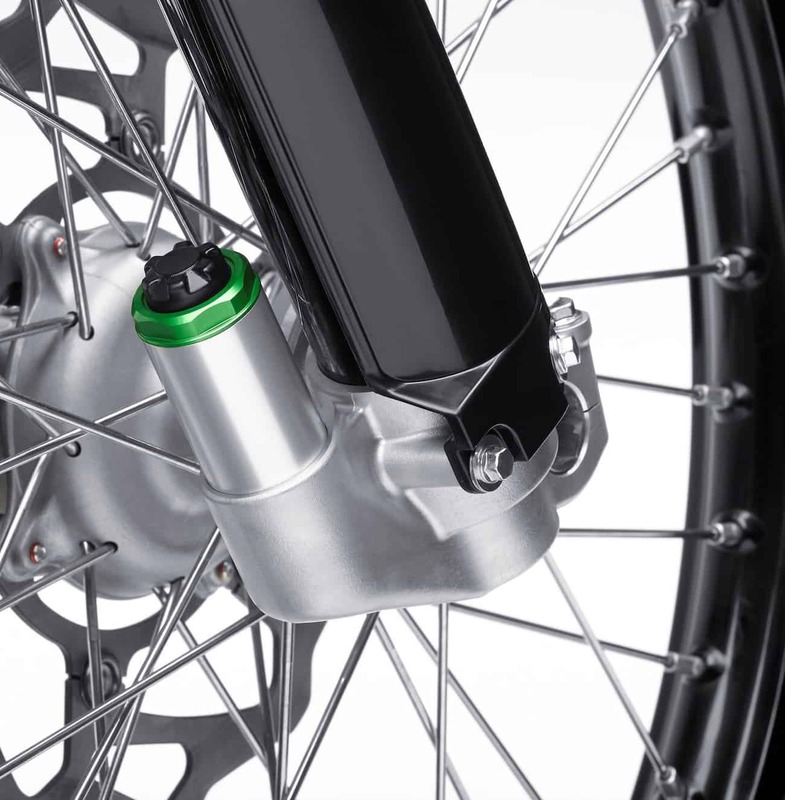 The only SFF-TAC air fork left in production is on the KX450F. Q: WHAT’S THE BIGGEST PROBLEM WITH THE KX450F FORKS? A: Of the “Big Four” Japanese brands, the 2018 Kawasaki KX450F is the Lone Ranger in spec’ing air forks. Yamaha, Honda and Suzuki are all coil-spring-equipped in 2018. The move from air forks wasn’t based on performance. Kawasaki’s Showa SFF-TAC forks are amazingly tunable, 3 pounds lighter than spring forks and superior to any air fork that Honda or Suzuki ever mounted on its machines. If performance wasn’t the issue, what was? Consumer resistance killed the air fork. The buying public didn’t like the constant attention that Showa and Kayaba air forks required. The consumers’ dislike of air forks was viewed as an impediment to sales. Do you remember KTM’s single-sided, no-link, PDS rear system? When set up properly, it could be made to work as well as a rising-rate linkage, with the bonus of being 5 pounds lighter. KTM defended PDS “almost” to the death, but finally went to a linkage rear system in 2011. KTM was willing to pay the 5-pound penalty and surrender its commitment to PDS, not because the engineers felt that linkage was better, but because the American public didn’t want PDS. Guess what? Kawasaki will also have to surrender—and the sooner the better for its sales numbers. What does this mean for the KX450F? 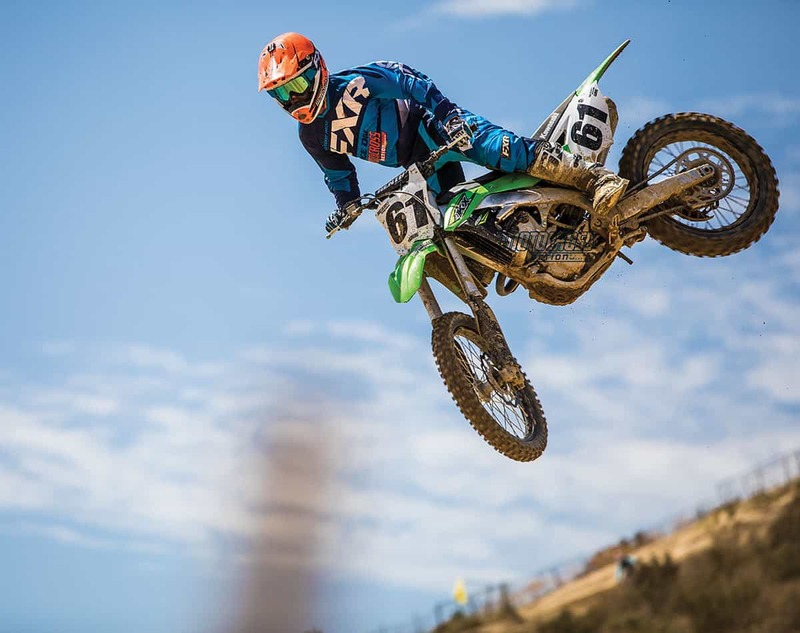 It means that the anti-air brigade will avoid the 2018 Kawasaki KX450F in favor of bikes with coil-spring forks—or KTMs and Huskys with their simple and effective WP air forks. That’s sad, because these are the best Japanese air forks ever (much better than the SFF-TAC forks that came on other brands). Q: DOES THE KAWASAKI KX450F NEED ELECTRIC STARTING? A: In all seriousness, no 2018 Japanese 450 motocross bike can afford to switch to electric starting. Yes, we know that the 2018 Honda CRF450 and Yamaha YZ450F have already switched. But, the price was too high—and we aren’t talking about dollars and cents. The real price of electric starters is tonnage. The 2018 Yamaha YZ450F weighs 239 pounds (1 pound more than it did with a kickstarter), while the 2018 Honda CRF450 weighs 240 pounds (7 pounds more than it did with a kickstarter). In what world is adding weight to an already heavy machine considered a plus? The marketing men at Honda and Yamaha demanded electric starting. They felt that without it KTM would leave them in the dust on the showroom floors. But, a KTM 450SXF weighs a feather-like 222 pounds (with electric starting). KTM spent 10 long years whittling weight off the 450SXF to justify the magic button. Honda and Yamaha? Not so much. What does this have to do with the 2018 Kawasaki KX450F? After all, it doesn’t have electric starting. And that’s a good thing. The 2018 Kawasaki KX450F weighs 231 pounds. It is the lightest Japanese 450 by 8 pounds under the YZ450F, 9 pounds under the CRF450 and 10 pounds under the RM-Z450, which would have weighed approximately 246 pounds if it had electric start. Thus, kudos to Kawasaki for not chasing the elusive electric unicorn. 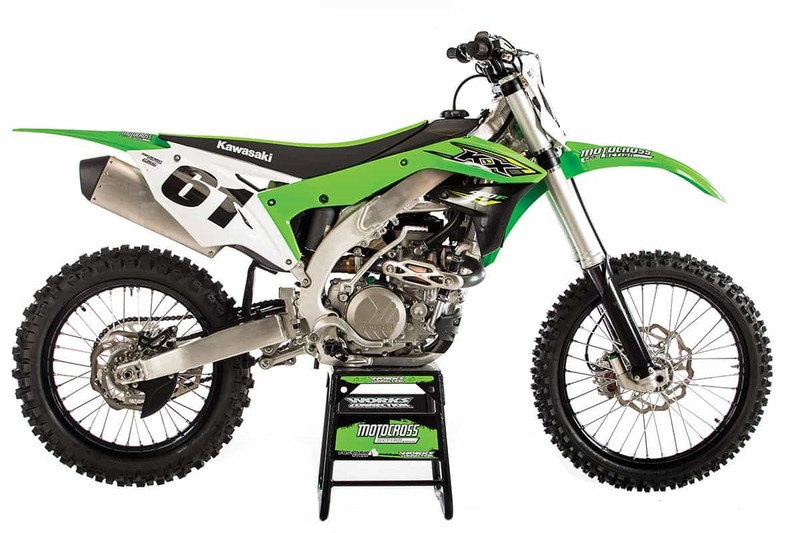 The KX450F is the only Japanese 450 that didn’t gain weight in 2018. The 2018 KX450F is the lightest 450 motocross bike not built in Austria. It is 8 pounds lighter than a YZ450F, 9 pounds lighter than a CRF450 and 10 pounds lighter than an RM-Z450. Q: WHAT’S WRONG WITH THE 2018 KAWASAKI KX450F CLUTCH? A: What clutch? What is it with clutches from the Big Four? They are pitiful, especially when compared to what’s available on the European machines. If you are a clutch user, you will feel slipping in a couple of races. If you are a clutch abuser, you will feeling slipping in a couple of motos. The MXA wrecking crew doesn’t even waste time with the stock KX450F clutch; we switch to stiffer Pro Circuit clutch springs on day one—and you should too. Q: WHAT DON’T WE LIKE ABOUT THE 2018 KAWASAKI KX450F AIRBOX? A: It’s more of a rabbit hutch than an airbox. Kawasaki has made no attempt to stop dirt, water or small birds from coming into its airbox. 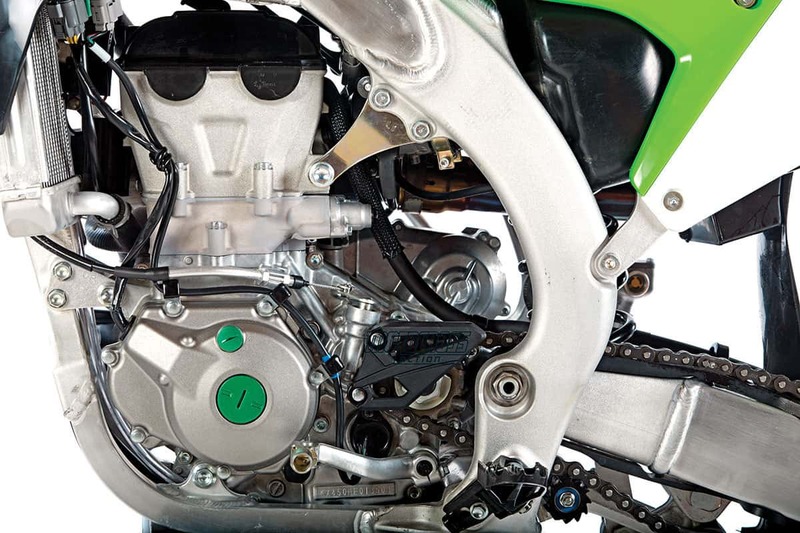 Both sides of the KX450F airbox have freestyle-like handholds that allow massive amounts of air into the engine; however, if you don’t tape them off when washing your bike or when getting splashed in puddles on the way to the first turn, water will get on your air filter (and dissolve the air filter oil). We are all in favor of getting maximum air to the engine, but not if it comes with maximum dirt. Kawasaki’s engineers need to put a little more thought into all aspects of airbox design in the future. Paradoxically, Honda copied Kawasaki’s open vents on the 2017–2018 CRF450. The 2018 KX250F has the same triangular holes on both sides of its airbox, but Kawasaki installed a plastic wall to block off the right-side hole. If you think they did it to keep dirt out, you are wrong. They did it to cut down on intake noise to help pass AMA sound tests, which are conducted from the muffler side. European KX250Fs have both sides blocked. Q: WHAT’S THE DEAL WITH KAWASAKI CHAIN GUIDES? A: If you ever owned a Kawasaki, you know that the rear chain guide and buffer pad start out on life support and expire in short order. The chain will actually eat through the stock chain to the extent that the chain will come out the bottom of the guide. This means that you not only ruin the rubber buffer pad, but the structural part of the chain guide as well. Ten years ago MXA complained in our KX450F test that Kawasaki’s chain guide “doesn’t last long enough to get attached to.” Our solution, 10 years later, is to keep T.M. Designworks’ phone number on speed dial. T.M.’s chain guides last forever. Here is the number: (541) 772-4161. 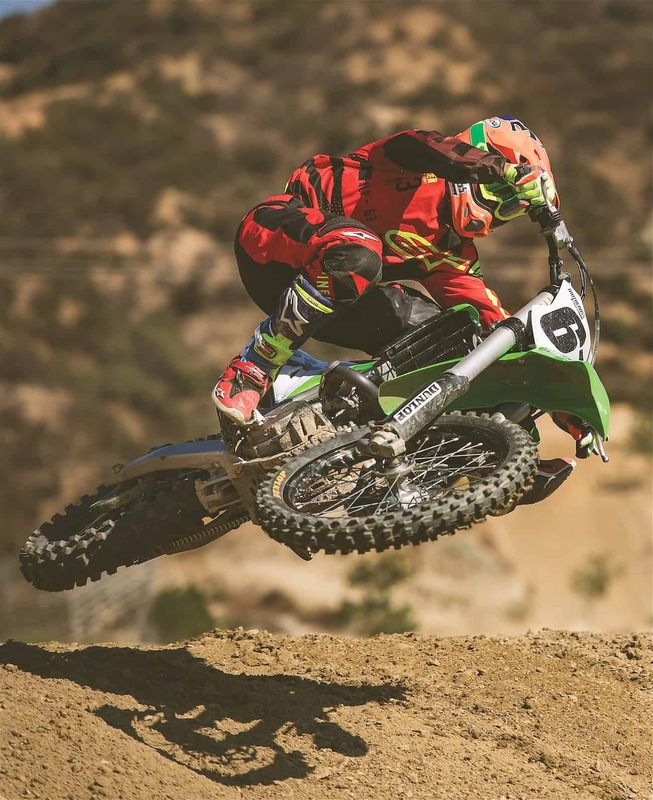 Q: DOES THE 2018 KAWASAKI KX450F NEED MORE HORSEPOWER? A: We know that this goes against the grain of internet “wisdom,” but 450cc motocross bikes are not too powerful for the average rider. And, contrary to popular opinion, some are actually too slow. What rider, Novice, Intermediate or Pro doesn’t use every ounce of power that his bike makes on the charge to the first turn, down long straights, when drag racing out of corners, over jumps with short run-ups and when climbing big hills? 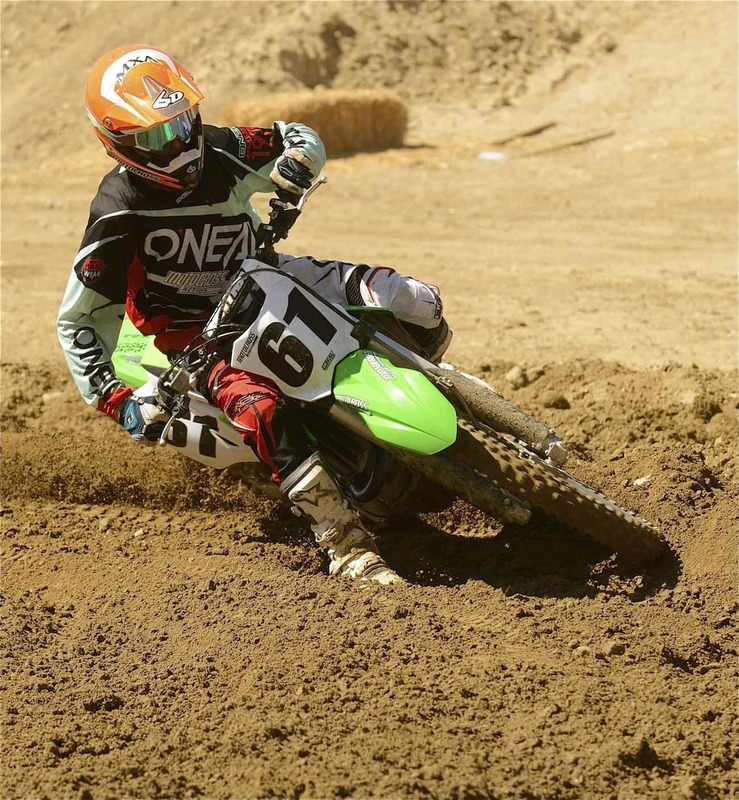 Horsepower is your friend; however, having the most horsepower is not the be-all and end-all of motocross success. Instead, having the right kind of horsepower is. There is one caveat to “having the right kind of horsepower” theory. That caveat is that the more horsepower you have to work with, the easier it is for the factory engineers to make it mellow at low rpm, manageable in the midrange and broad across the top. The best example of the “right kind of horsepower” is the KTM 450SXF. It has lots of horsepower—and that power is metered to pull longer than any other engine on the track. Its luscious, long, optimally usable powerband comes from the fact that it has excess power to play with. It doesn’t blast power as much as it oozes it. Which leads us to the 2018 Kawasaki KX450F powerband. It is supremely usable, very linear and never scary. It is, however, not all that fast. In a straight line, it gives up 2.5 horsepower to the Honda, KTM and Husqvarna. 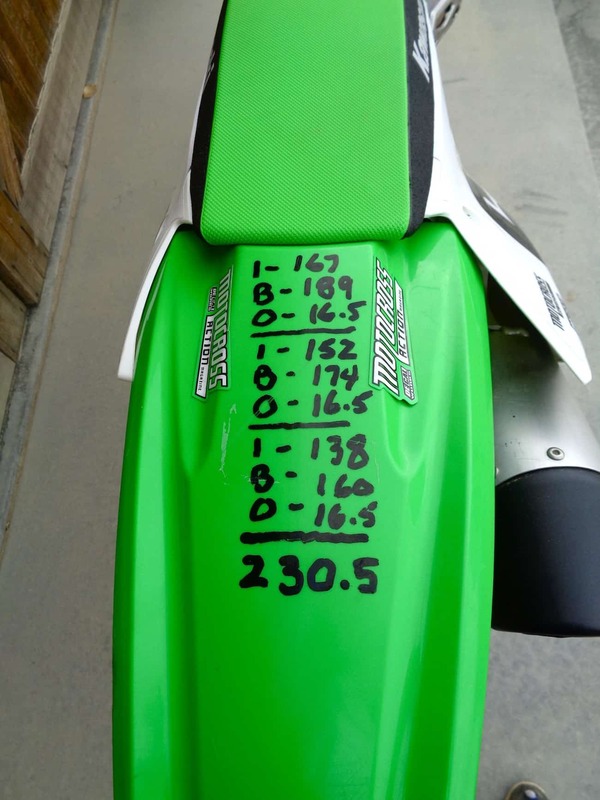 When you consider the fact that the KX450F isn’t good above 8800 rpm, you have no incentive to rev it. It is very good in the midrange, but it gives up 3 horsepower at 10,000 to every 2018 450, save for the Suzuki RM-Z450. How much does it fall off after 9000 rpm? By 11,000 rpm, the KX450F makes 10 horsepower less than the CRF450 and YZ450F. 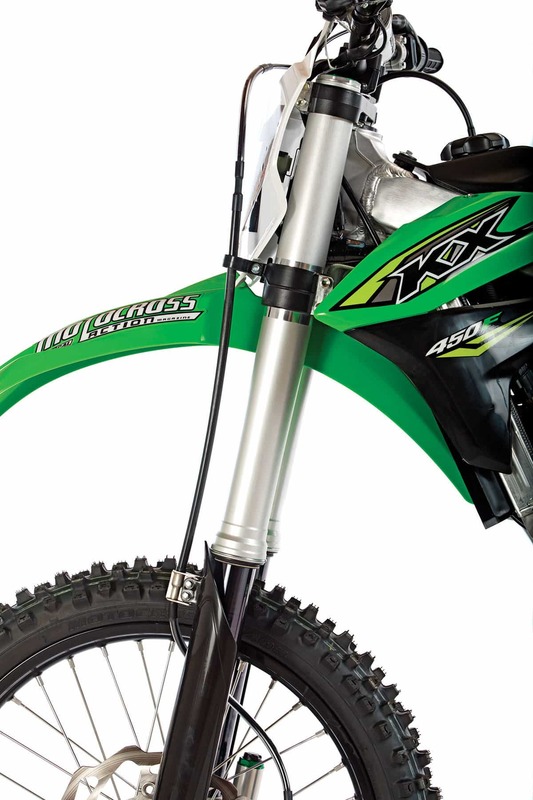 There is no doubt that the KX450F suffers in the broadness category. For more mid-range hit we use an FMF exhaust. Still, the vast majority of MXA test riders like the KX450F engine. It is a solid midrange engine that puts all it has into the ground. In fact, the KX450F makes more horsepower in the midrange than the Honda, Yamaha or Suzuki—and matches the KTM and Husky where the power counts most. The only advice we have for KX450F riders is, don’t rev it past nine grand. The KX450F makes more horsepower in the midrange than the Honda, Yamaha or Suzuki—and matches the KTM and Husky where the power counts most—low to mid. However, it doesn’t have class-leading horsepower or top-end. Q: HOW DOES THE 2018 KX450F HANDLE? A: If you haven’t ridden a KX450F in the last two years, you are in for a pleasant surprise. Gone is the cranky, upright and flawed handling of the past. The new generation of KX450Fs (2016–2018) are light, agile and quick. This bike, dare we say it, doesn’t feel anything like a Kawasaki. That is a compliment. Don’t wait. Order a TM Designworks chain guide the day you buy your KX450F. You’ll need it. (1) Rear brake pedal. For our tastes, the rear brake pedal could use more adjustment range. It is easy to run the brake pedal high but almost impossible to run it low—without locking up the rear brake. (2) Linear powerband. The 2018 KX450F is smooth, mellow and easy to ride. That’s what we want in a camel on the way to see the pyramids, but not in our race engines. (3) Airbox. Air gets in, but so do local ground squirrels. (4) Chain guide. 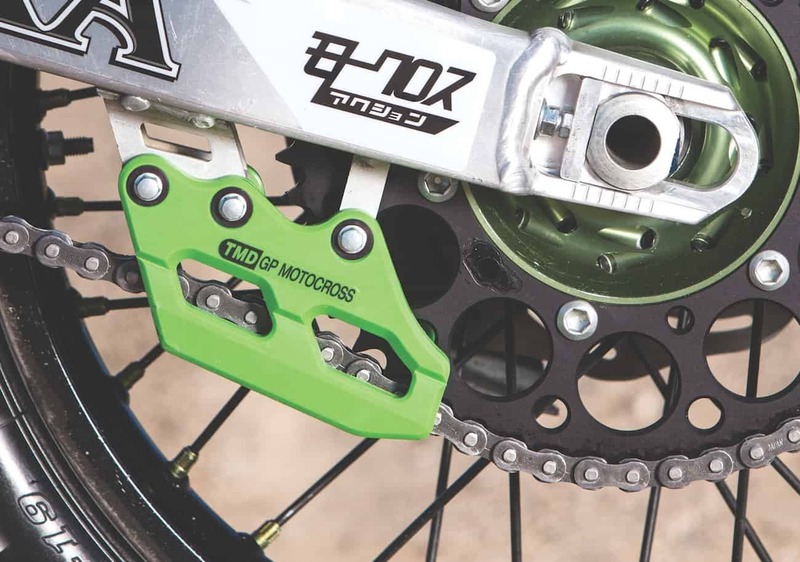 The KX450F chain guide is butter to a chain. (5) Kickstarter. The 2018 KX450F starts easily, but only if you can get your leg up high enough to get a full kick. Short people will have issues. (1) Mapping tool. Kawasaki’s hand-held calibration tool is literally a works part. It stores 200 different maps (199 of them wrong). Sadly, it costs $700 (and won’t hold a charge past one day). (2) Launch Control. We run it on concrete and hardpack starts but not on loamy starts. (3) Air pump. Kawasaki gives every KX450F buyer a digital air pump. Not supplying an air pump is like not putting coil springs in a normal fork. (4) Footpegs. The KX450F footpegs can be moved down 5mm if you so desire. No MXA test riders have ever desired to do so. (5) Tires. The stock rubber is a Bridgestone 403/404 combo. These are very good tires. The Kawasaki KX450F is a workhorse machine that isn’t superlative in any characteristic, but capable of getting the job done. A: In “year three” of its four-year production schedule, Kawasaki is going to have trouble finding buyers for a bike that is steady, predictable and has a good personality. To most buyers, that just sounds like a bad blind date. We doubt that it will move many souls, but, in truth, the MXA wrecking crew likes this bike a lot more than this test makes it seem. This is how we set up our 2018 Kawasaki KX450F for racing. We offer it as a guide to help you find your own sweet spot. Notes: As a general rule, we always run more air pressure in the balance chamber than in the inner chamber. This lets the forks settle and not ride as high in their stroke, which helps the KX450F turn better. MXA writes the fork settings on the rear fender so that Vet, Intermediate and Pro test riders can make quick adjustments for their speed. Notes: The shock was easy as pie to set up. The rear end had minimal wallowing and worked very well under braking in chop and square-edged bumps.